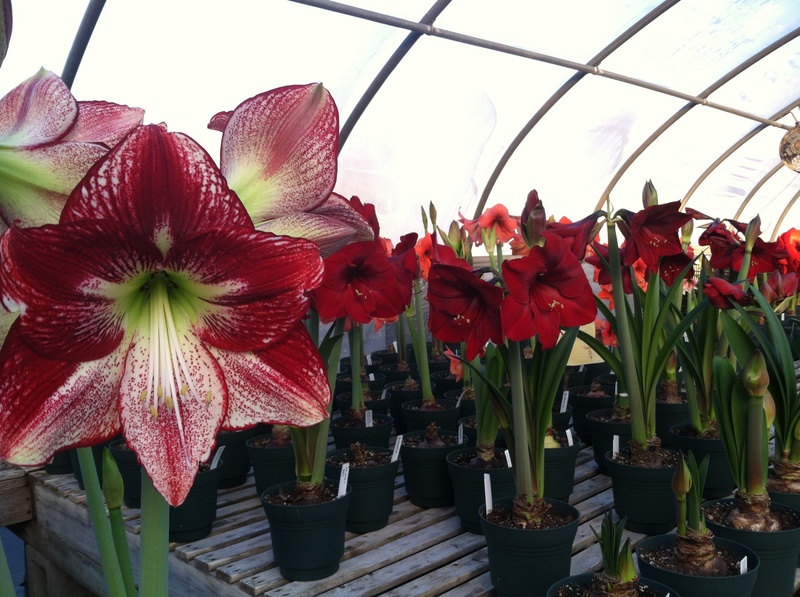 In the midst of a Connecticut winter, one of our greatest pleasures is to make our way each day to the greenhouse where we annually conduct our Amaryllis trials. Picking our way across a wintry landscape with snow-covered acres and bare trees, we open the door onto a scene more closely reminiscent of the tropics. A burst of moist air fogs up our eyeglasses, the scent of damp earth greets our noses, and rows of colorful blossoms sparkle in the winter sun. Our Amaryllis trials are many months in the making. The process begins in March when our company president, Lorraine Calder, visits growers in Holland and selects new varieties to sample. She might also take a fresh look at some tried-and-true varieties that have been grown for years and are ripe for a comeback. All of the bulbs she is shown are 2 years old, which matches the age and size of the bulbs White Flower Farm offers its customers. Lorraine looks for Amaryllis with Interesting color combinations. In making her selections, Lorraine keeps an eye out for Amaryllis that are different in some way from the varieties we currently offer. She might be drawn to an Amaryllis that flowers in a unique color, shows interesting patterns or details on its petals, has a notable blossom size or shape, or has a stem that is especially tall, or short or colored. She seeks out Amaryllis varieties that have considerable flower power and have been shown to consistently produce a generous number of blossoms. Lorraine makes her final selections and places the order for bulbs. As she returns to Connecticut, the bulbs are planted in greenhouses in Holland then, months later, harvested and loaded into temperature-controlled shipping containers for their trip across the sea. When they arrive in Connecticut the following November, our head gardener, Cheryl Whalen, begins the trialing process. In December, she pots the bulbs in soil and places them in the greenhouse where they receive occasional water and the brightest sun that winter has to offer. 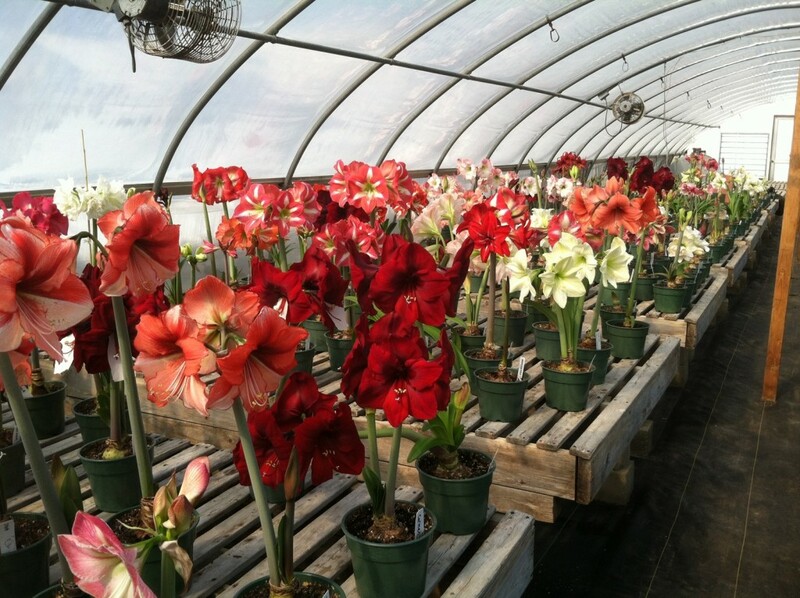 The number of Amaryllis varieties tested each year varies. 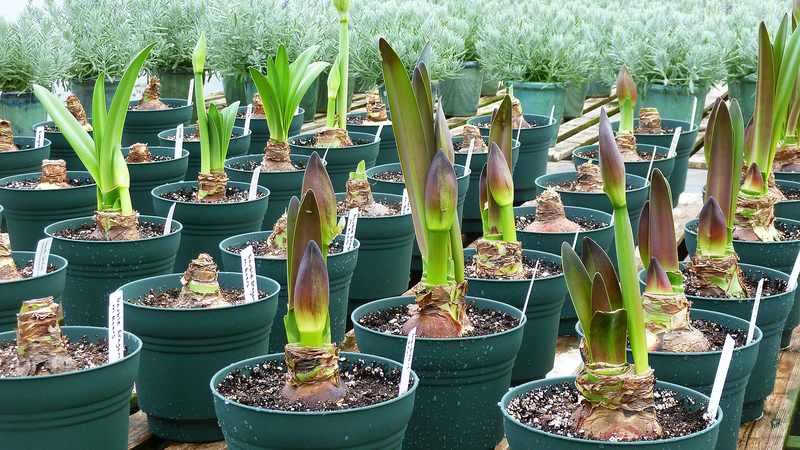 This winter, we’re trialing almost 20 new ones, which means growing roughly five to 10 bulbs of each type. In addition, we’re growing a sampling of the varieties we currently offer. It’s the surest way we know to make certain that year after year, these bulbs meet our expectations – and yours. 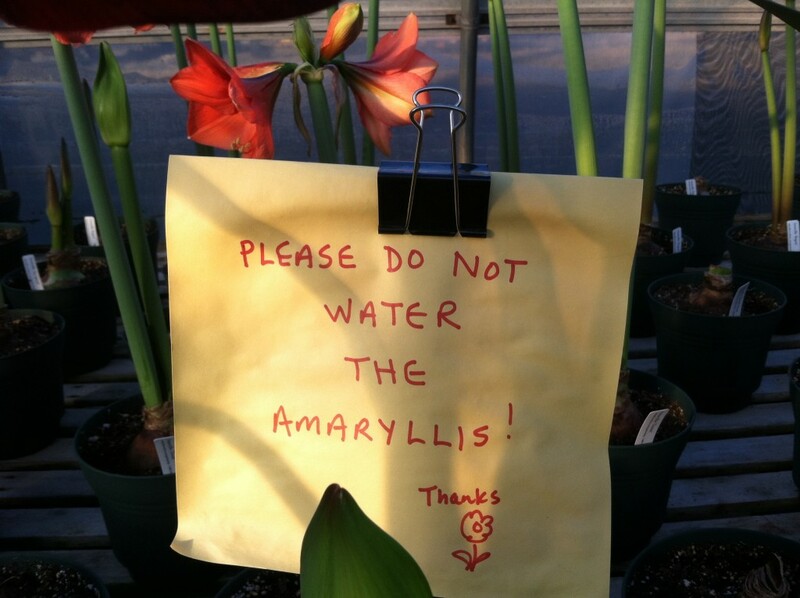 Our head gardener, Cheryl Whalen, is the only one allowed to water the trial Amaryllis! Each trial process generally includes a range of varieties: Single, Double, Bicolor, Cybister, Small-Flowering, and South African. As the bulbs sprout stems and begin to flower, a process that unfolds over roughly 8 to 10 weeks, Cheryl follows the development of each variety, taking notes and pictures. Bulbs are evaluated for vigor, quality of individual attributes, and overall performance, and to determine whether or not they live up to a growers’ billing. When the new Amaryllis achieve full bloom in and around late January or February, a team of staff members selects “winners,” the varieties that will be offered to White Flower Farm customers. Only varieties that are beautiful, unusual, and absolutely reliable for high performance are chosen. Plants that do not measure up to our expectations or too closely resemble varieties we already offer are eliminated. This year’s trials include almost 500 bulbs, some are brand new to us, others are classics and favorites that we retrial to monitor quality. This Amaryllis has no name yet! 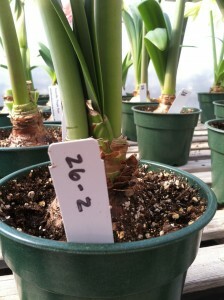 Some of the new Amaryllis varieties arrive pre-christened with names provided by their growers. Varieties with no names are assigned numbers for the trial period. Later they’ll be named by our Dutch partners, or we’re given the fun job of choosing what to call them. Bulbs selected during the trial process are not always available for the following year’s holiday catalog. If a bulb is a new introduction, it can take several years to grow a sufficient quantity to offer it widely. Winning varieties will be offered to customers as soon as breeders can provide enough bulbs. I can’t wait for your new Amaryllis, I have become a true fan of your beautiful, healthy bulbs…my problem is I lost the name tag for my red with white tips on the end of each petal…there are six pedals per bloom…can you help me ? Looks like you only have one page for houseplants. Why so few? Unfortunately many houseplants do not ship well in colder weather, but we are always adding to our offering. I purchased an analysis from you before Christmas. To say I am happy with the purchase is an understatement. I have had three flower buds with 3 to 4 actual flowers from each one. They have been so beautiful. You have a customer for life. Everyone that sees them are so amazed. Thank you! Beautiful to see on this snowy day. Love we live so close! See you in the Spring! Do you EVER get an amaryllis bulb to rebloom the following year? I have NEVER achieved this. Not for lack of trying, or following the directions to a T.
Yes, we are able to get the bulbs to rebloom. Here is a link to our cultural instructions that explain the process. I love these. They are beautiful and one of my favorite flowers. Do you have an annual catalog to order them from or do you only market commercially? What a great explanation of your work. Certainly a labor of love. 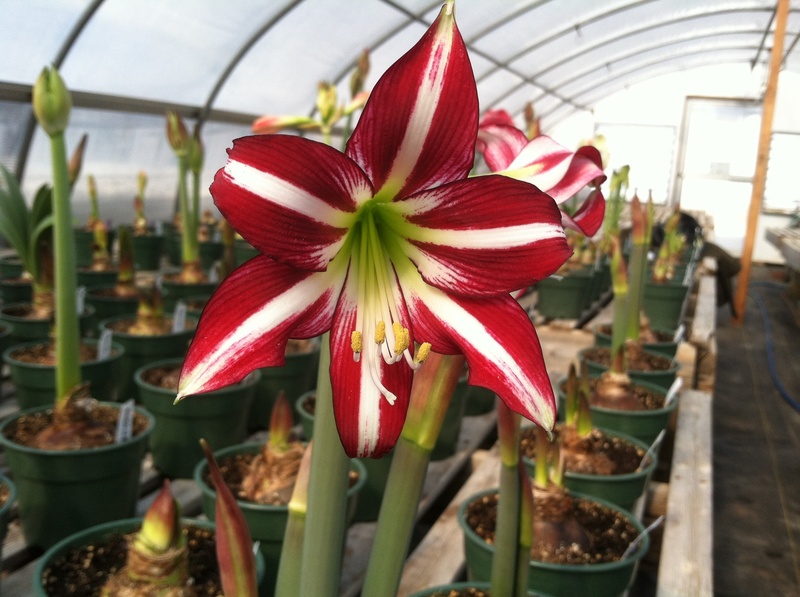 Thank you for this interesting article and gorgeous pictures of your Amaryllis. The greenhouse is my ideal working environment. I envy those who work amidst these glorious blooms! Very interesting article. Gives new appreciation for amaryllis. 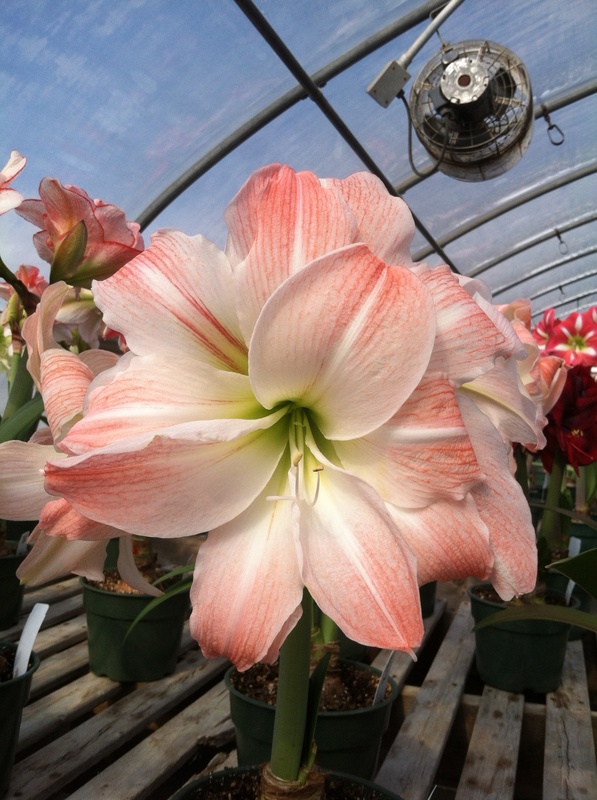 Amaryllis Spotlight – fabulous! I purchased a bulb in fall 2014 and had 2 stems with beautiful blossoms at Christmas. I followed your directions to keep the bulb and put it outside in summer. In late August I looked twice – it was in full bloom again, 1 stem! I cut back the bloom stem, waited for frost, cut back the leaves and put it in a dark place in my basement wondering what would happen. In early Jan. I looked and it had grown 18 inches – the stem was pure white (no light down there) no leaves! I brought it up to the sunny window – turned green in a few days and proceeded to grow to 33 inches with one stem and 4 beautiful flowers! Now has leaves and I will try again – what an amazingly hardy flower! Thank you! I saw in the Better Homes magazine, March, 2016 page 77, an ad for meyer lemon tree for $39.95 with your web address. I went to this website, and cannot find it! I am specifically looking for a dwarf variety. I would like to grow it on my patio so it can be protected in the winter. We live in Lindale, Texas.